MONTEREY, CA – November 29, 2017 – LanguageLine Solutions® has been named a gold winner in the Most Innovative Service of the Year category in the Best in Biz Awards, the only independent business awards program judged each year by prominent editors and reporters from top-tier publications in North America. The company took home the award for its revolutionary video remote interpreting (VRI) application, LanguageLine InSight®, a breakthrough on-demand technology that empowers clients to provide outstanding service and exceptional care to limited-English-proficient, deaf, and hard-of-hearing populations. Accessible via tablet, smartphone, or PC, InSight replaced the need for phone lines or specialized equipment when it was released a year ago. Every InSight session is natively encrypted, which ensures privacy and eliminates the need for VPN tunnels. 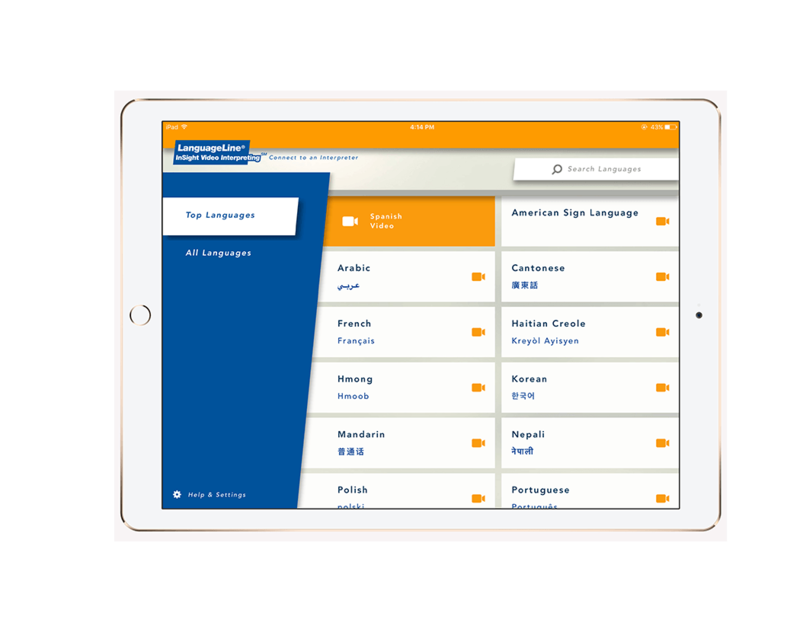 The application enables fast, one-touch access to more than 9,000 professional linguists, who provide interpreting via live video in 35 top languages (including American Sign Language) and audio-only interpreting in 240 languages. InSight’s video component facilitates full understanding through both spoken and visual communication, which reduces the risk of misunderstanding by capturing body language and facial expressions. InSight has received thousands of installations throughout North America since it was launched a year ago. Users report that InSight is extremely easy to use, as well as being an indispensable resource in improving customer and patient satisfaction in hospitals, retail locations, banks, government agencies, and law-enforcement settings. InSight allows users to rate their completed session and provide the LanguageLine team with valuable instant feedback. Over the course of hundreds of thousands of InSight calls, users have given an average score of 4.6 stars (out of a possible five). Each year, Best in Biz Award entrants extend across a spectrum, from some of the most innovative local start-ups to the most recognizable global brands. The seventh annual program was hotly contested, with hundreds of entries from an impressive array of public and private companies of all sizes and from a variety of industries and geographic regions in the U.S. and Canada. LanguageLine Solutions has been the global leader in innovative language-access solutions since 1982. The company provides the highest quality phone, video remote, and onsite interpreting, as well as translation, localization, and testing and training for bilingual staff and interpreters. Trusted by more than 27,000 clients to enable communication with the limited English proficient, deaf, and hard-of-hearing communities, LanguageLine delivers the industry’s fastest and most dependable access to highly trained, professional linguists in more than 240 languages, 24 hours a day, seven days a week, 365 days a year. LanguageLine facilitates more than 33 million phone, video, and onsite interactions every year, which amounts to a new connection every second. Since 2011, Best in Biz Awards, Inc. has made its mark as the only independent business awards program judged each year by a who’s who of prominent reporters and editors from top-tier publications from North America and around the world. Best in Biz Awards honors are conferred in two separate programs: North America and International, and in 65 categories, including company, team, executive, product, and PR and media.